Saturday’s softball scrimmages between Cleburne and Palestine will extend beyond the challenge to see which JV and varsity teams score the most runs. The Lady Jackets and the Lady Cats are also competing to see who brings the most Legos to the practice game to benefit Brody Nelson’s Legos for Little Warriors project. The competition was proposed by Regis Andrez, a member of the Cleburne High School Class of 2000 and the new head softball coach at Palestine. Brody, a fourth grader at Coleman Elementary, is currently undergoing chemotherapy that has reduced a lemon-sized tumor and a series of smaller tumors in his brain to an undetectable proportion, with no additional tumors developing. His treatment includes a monthly visit to St. Jude to meet with his medical team. His passion for Legos and his compassion for fellow “soldiers” battling cancer led to “Legos for Little Warriors.” The idea for the project was born in late September during Brody’s participation in Fort Worth’s St. Jude Walk and Run to End Childhood Cancer. His thoughts took shape, with the first donations to Legos for Little Warriors arriving on his tenth birthday last October. All he wanted for his birthday were Legos—for his project. Family and friends, including members of the CHS baseball team, who have named Brody an honorary member, came to his party with Legos in hand. Word of his project quickly spread, with fellow members of Westhill Church of Christ joining the initiative. The Dallas Stars has promoted his initiative, with a number of hockey fans bringing Lego kits the night Brody dropped the puck at the team’s “Hockey Fights Cancer Night” event. More than 1,300 kits have been donated to Legos for Little Warriors since Brody’s birthday/launch party. Chavez and his Lady Jacket softball team are hoping to add to that number. Chavez understands well the journey Brody, and fellow cancer fighters are making. More than 15 years ago, Chavez was diagnosed with Hodgkins Lymphoma, which was followed by a year of radiation and recovery. Chavez, like many educators, has seen multiple children battle cancer and other medical conditions. Many of the Lady Jackets met Brody for the first time on Tuesday, although they all knew his story. In his locker room meeting with them, he shared what the Legos they were collecting would mean to the little warriors receiving them. "Being able to help Brody means a lot,” senior team leader Baylie Ritchie said. “Meeting him made my day, because I absolutely adore how he took his love for Legos and thought about others. Helping others is such a big thing to be proud of. I can't wait to start the season and be able to share the love of this sport with Brody." The ten-year-old will be throwing out the first pitch at an upcoming CHS softball game. Already a seasoned baseball player, Brody will be getting in some practice softball pitches with his father, who plays on their church team. 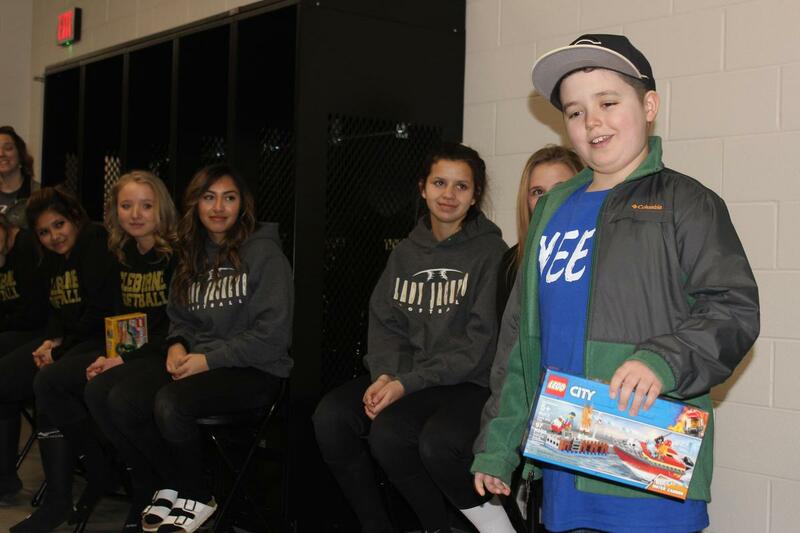 Brody, who is now known as the “Lego kid” at St. Jude, described his meeting with the softball team as ‘very cool.’ He’s also very excited to have them join his Legos for Little Warriors team. He left their meeting with an armload of kits donated by the Lady Jackets—with a promise of much more to come. Saturday’s scrimmages will begin at 11 a.m. with the JV, followed at 1 p.m. with the varsity. 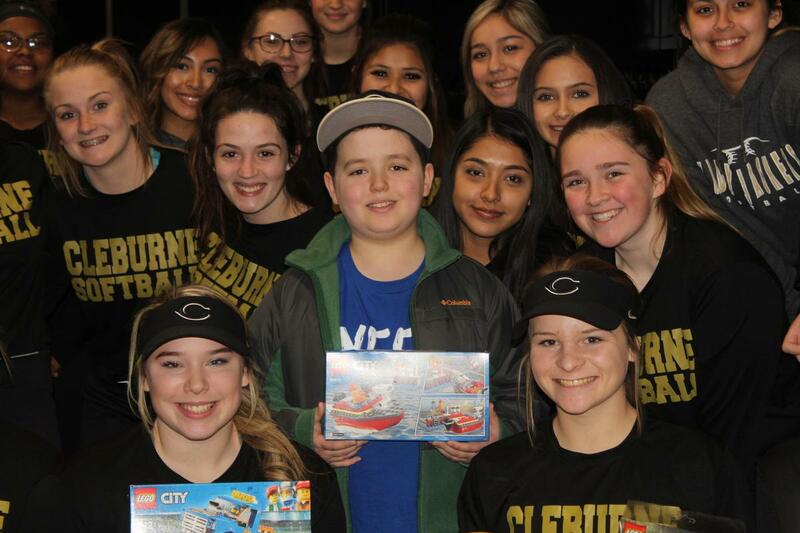 Brody Nelson shares the story behind his Legos for Little Warriors project to provide hospitalized children with Lego kits with members of the Cleburne High School softball team. The Lady Jackets are collecting Legos for Brody in conjunction with Saturday’s scrimmage with Palestine. 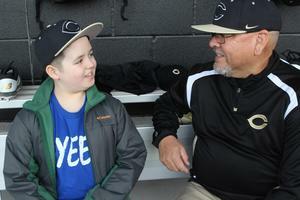 Cleburne Head Softball Coach Paul Chavez gets acquainted with Brody Nelson during afterschool practice on Tuesday. Both have battled the “big fight” with cancer.